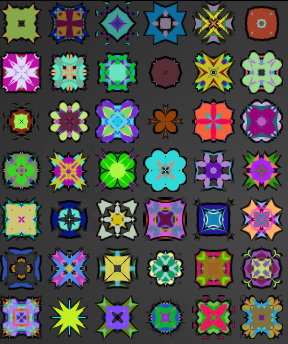 Grafixator generates random graphics. 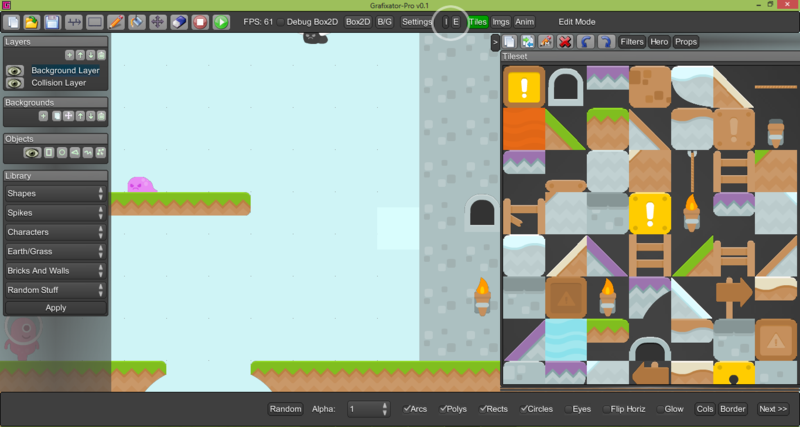 By selecting different combinations of shapes, borders, flipping, eyes and colours you can quickly generate random graphics to quickly use in your game. 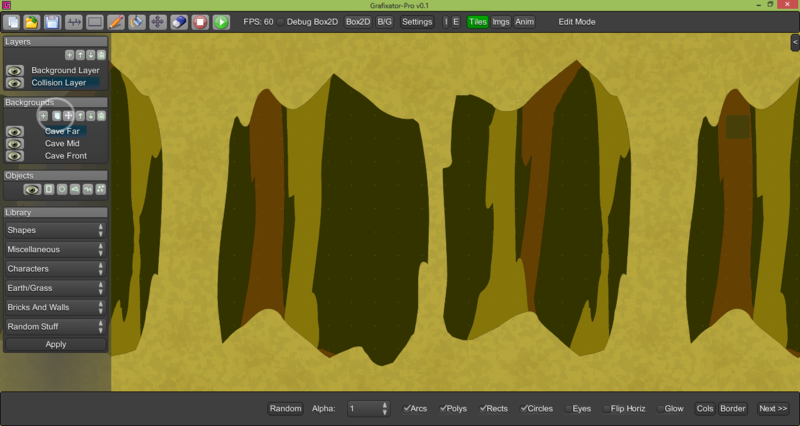 Many 2D filters available (many from JH Labs) to apply cool effects to your graphics. For example, the block filter can give your game a retro feel. 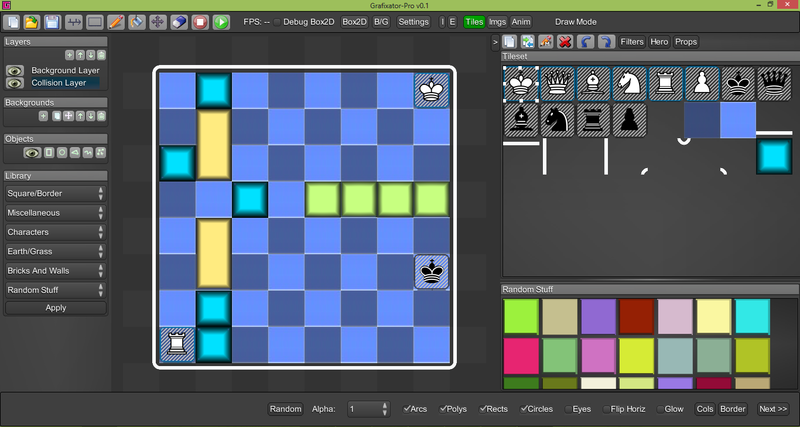 Select any tile, image or animation as your main controllable character. 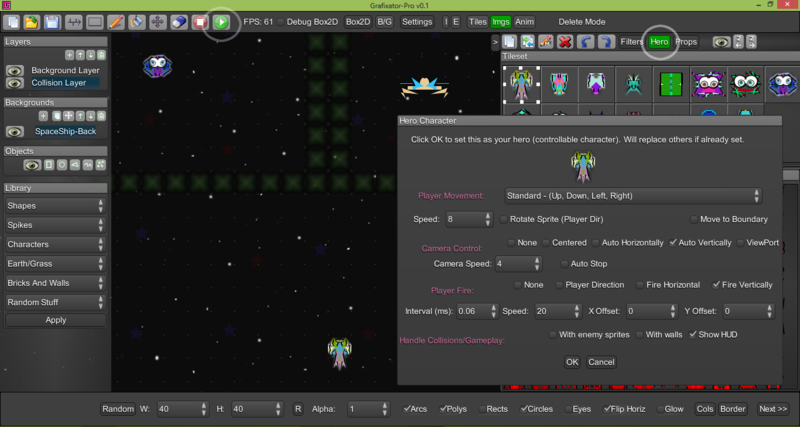 Many different player/camera movement options available and fire options for most 2D game genres. Click the play button to instantly try out your game. Java Universal Tween Engine integration. 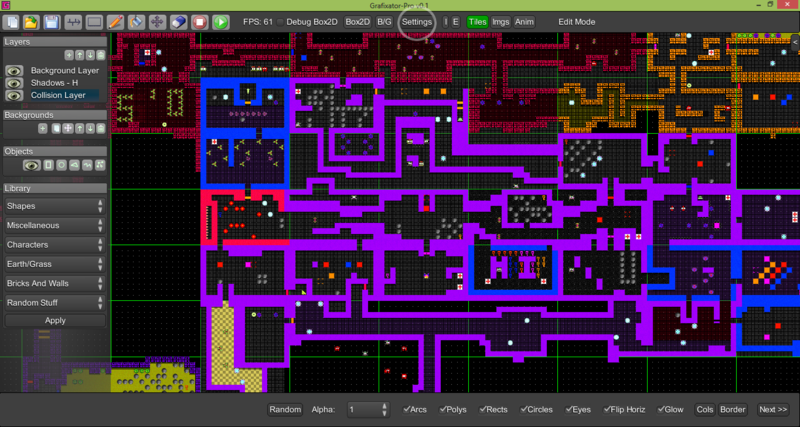 Tween any image around your game using your desired tween function. Can add 1 waypoint per event for tweening around curves. Perfect for platformers and shoot-em ups. 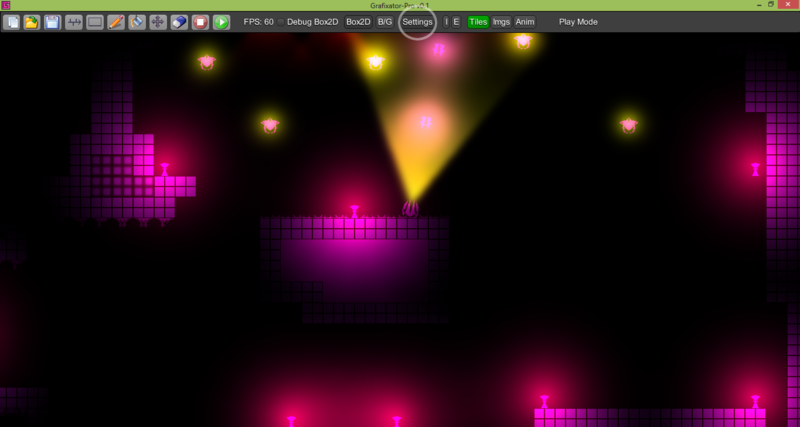 Box2D lights support (cone or point light) to any sprite, player or enemy bullet. Configurable ray colour, distance and angles. 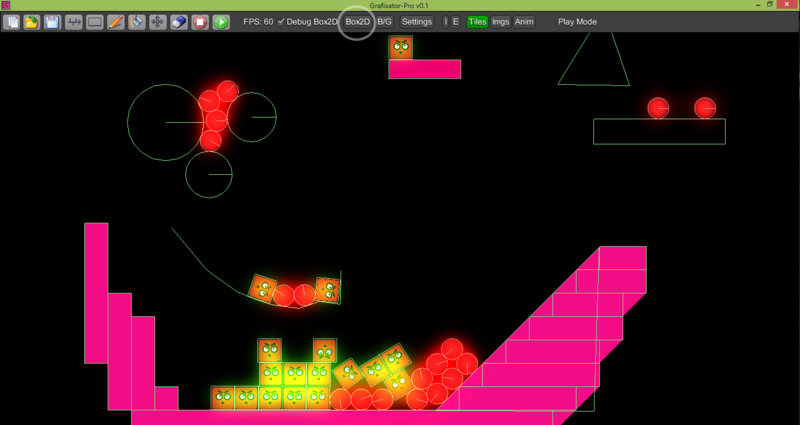 Assign circle or rectangle box2d shapes to any sprite plus create your own collision detection with geometric shapes (circles, rectangles, triangles and lines)..
Includes a basic, yet flashy particle engine. You can configure gravity, velocity and number of particles to add some nice little effects to your game. 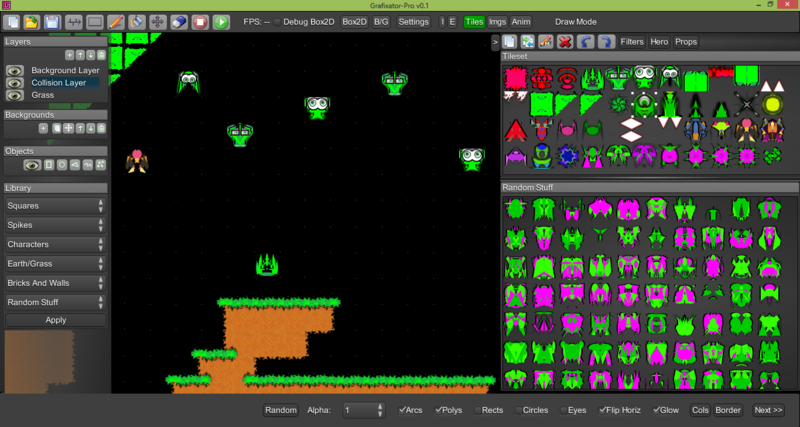 If you dont fancy using random images, simply import your own spritesheets and/or images (Open Game Art Bundle is used here). 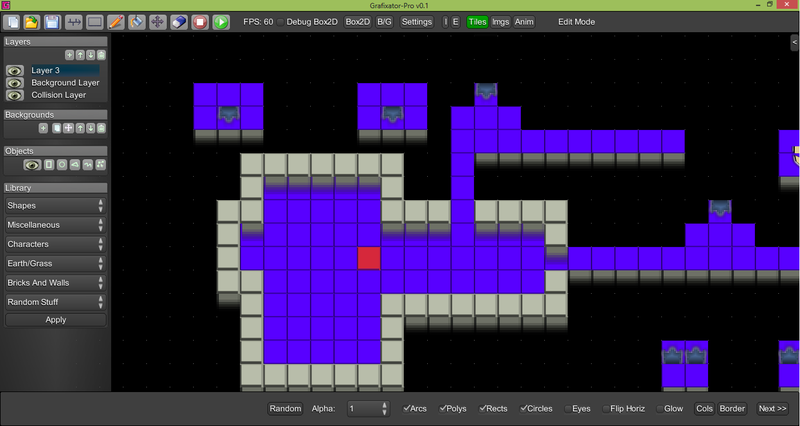 Configurable rooms grid for creating games with many rooms or screens, as in traditional platformer or 2D adventure games. Designing a 3D looking game. Nothing much to see here, move along. Grafixator was used to create all 200+ levels in Slide A Mate (Chess Puzzle Slider available in Google Play). Add up to 3 backgrounds with configurable horizontal/vertical speed, repeat-x and repeat-y. A library of animated and static images to use including some royalty free animations (SpriteLib and OpenBundle). Apply filters to give them your own unique feel, often with interesting results. Filters can also be applied to animations (filter applied to every frame). 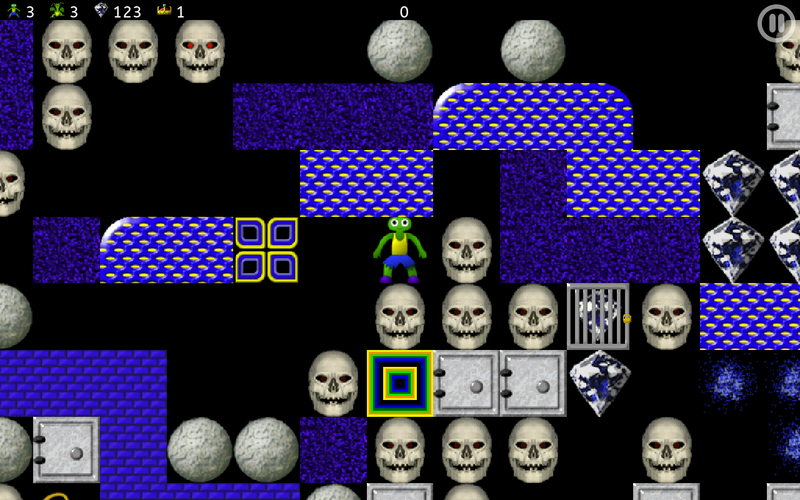 The classic puzzle game Repton 3 was built using the Grafixator API! Try it on Google Play! Wouldn’t it be awesome if you could randomly generate most of the graphics for your game in a matter of minutes, with no copyright concerns, no artistic ability required and quickly prototype your game ideas, each time with different unique results. Welcome to Grafixator. 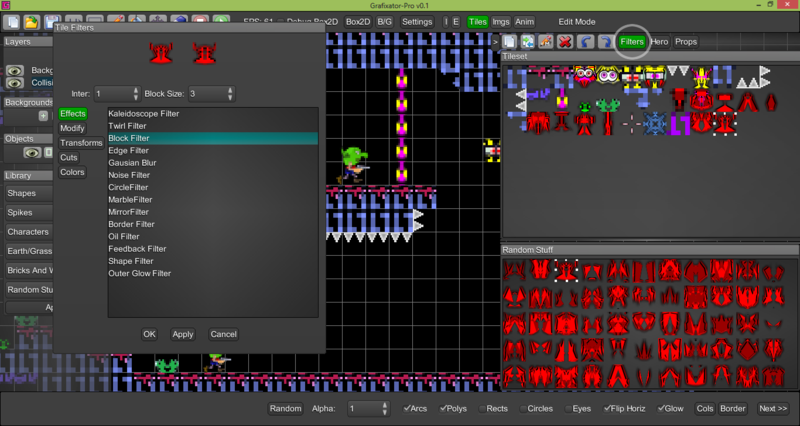 Grafixator is a Random Graphics Editor, 2D Tiled editor, scene editor and a basic Box2d editor. 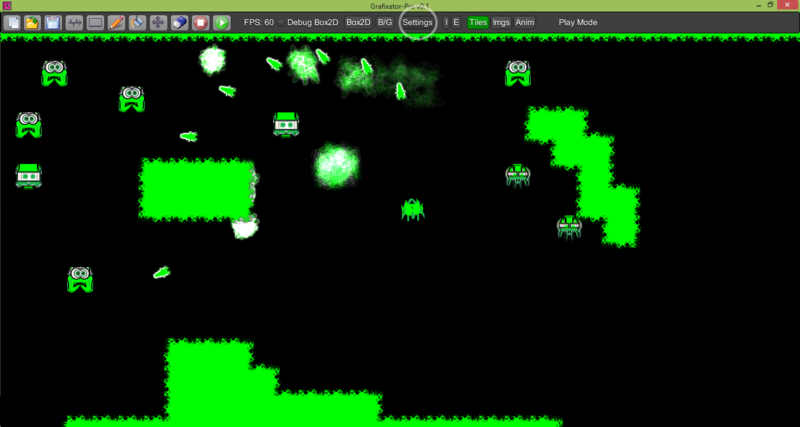 It also has Box2dLights, Sprite Tweening and a basic particle effects engine integrated. 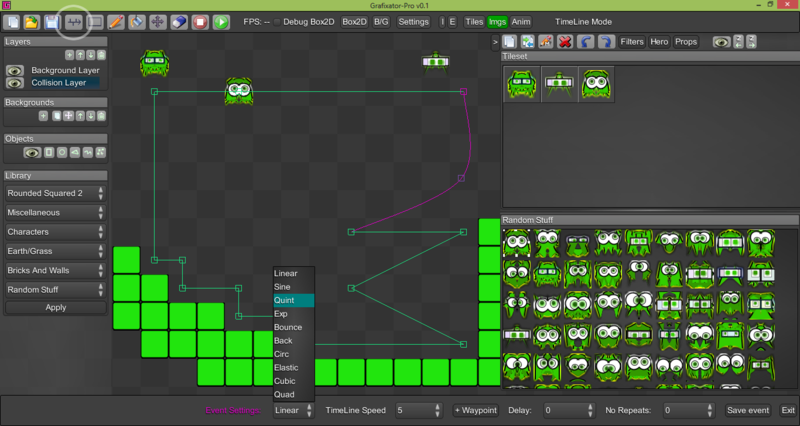 It also acts a simple game maker allowing you to select and control your main controllable character with various movements types, camera control and optional configurable fire. 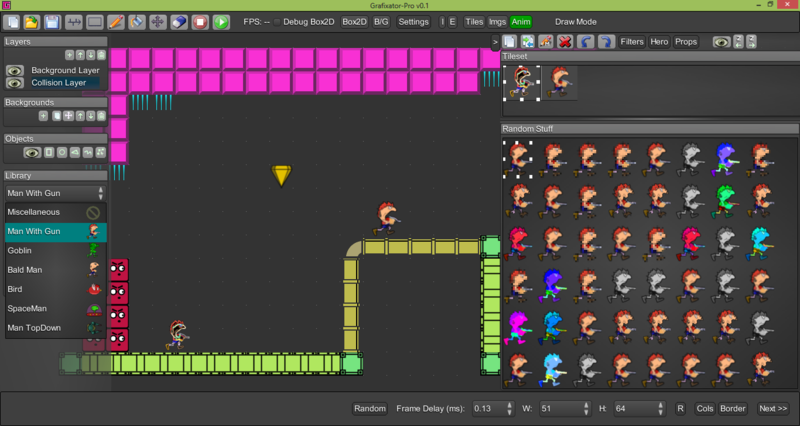 Games are saved as XML and there will be a free ‘open source’ Grafixator API for libgdx. See the Features and Goals page for a full list of features. Random images generated instantly. Generate until your heart's content! 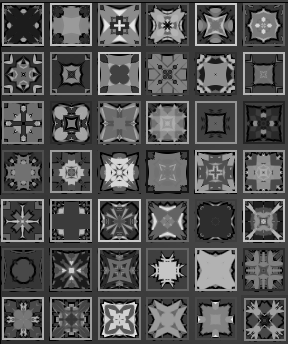 Infinite random grey tiles suitable for many game types. 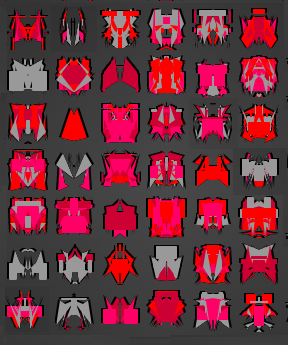 With horizontal flipping you can quickly generate random spaceships or bugs for shoot-em up games.